Did you step awkwardly into a hole, and now your ankle hurts? You may have a sprained ankle. Jay Bhuta, DPM, at Ankle & Foot Doctors of New Jersey in Millburn, New Jersey, is a podiatry expert and can evaluate your ankle and determine if it’s sprained and recommend treatment to promote healing and get you back to your usual activities. Call the office today or schedule an appointment using the online booking tool. A sprained ankle is an injury to the ligaments, which are the stretchy bands of tissue that hold the bones in your ankle in position and assist with its mobility, in your ankle. The injury most often occurs when you roll, twist, or turn your ankle in an awkward position, as may happen if you take a misstep, land poorly after a jump, or get stepped on. You may also hear a “pop” sound at the time of the injury, which may indicate a sprain. Should I get medical care immediately? Getting early treatment may also help make sure that your ankle sprain isn’t a more severe injury, such as an ankle fracture. During your evaluation, Dr. Bhuta examines your ankle and reviews the cause of your injury. To confirm a diagnosis and the severity of your injury, he may recommend an X-ray, MRI, or CT scan. The goal of treatment for your ankle sprain is to reduce your discomfort and promote healing. Dr. Bhuta develops personalized treatment plans based on the severity of your sprain and your medical history. To help you get around, Dr. Bhuta may prescribe crutches while your ankle heals. 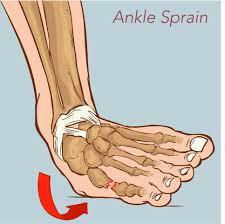 Surgery is very rarely needed for an ankle sprain. However, if conservative treatments fail to improve your sprain or you’re experiencing severe ankle instability, Dr. Bhuta may suggest surgery to repair your ankle ligaments. For expert care of your ankle sprain to help you get back to doing the things you enjoy as quickly as possible, call Ankle & Foot Doctors of New Jersey, or book an appointment using the online tool.